The secret of the gourmet saffron milk cap is in the ancient ways of pickling and preserving it. Russia’s protracted cold season has enriched the country’s cuisine with myriad methods for preserving food, which is pickled, candied, marinated, dried, variously cured, and frozen outdoors – this last method is exactly how the famed Siberian “pelmeni” are prepared. Pickling is perhaps the most original way of making Russian preserves; whereas Russian-style herring or cured meats differ from their European counterparts only in the choice of spices used, mushrooms and vegetables are prepared using entirely different methods. Mushrooms hold pride of place among Russian appetizers, which mostly consist of home preserves. As in the West, in Russia mushrooms are marinated, but any local cook will prefer to pickle his or her mushrooms or vegetables. In the process of pickling, the fresh ingredients undergo a process of lactic fermentation in their own juice, coupled with salt. The steps of this process have remained intact since antiquity, and are not employed in other countries; for example, when pickling cucumbers, the bottoms of oak barrels are covered with rye straw. The process of pickling mushrooms has its own secrets. 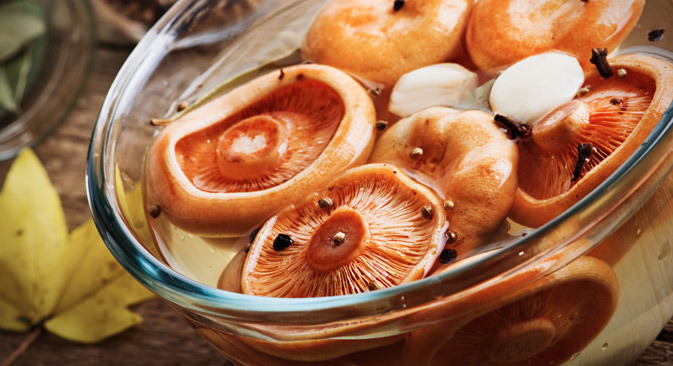 The undisputed king of pickled fungi is the gourmet saffron milk cap mushroom (Lactarius deliciosus), which outstrips porcini and milk-caps in terms of taste and assimilability. This agaric mushroom has a carrot-orange color with green specks, and is picked in early autumn. It’s considered especially good luck to come across this species, since it’s very sensitive to the state of the environment, and is now nowhere to be seen in the woods near Moscow, whereas 30 years ago, it was a common sight in the local pine forests. The primary region of saffron milk cap “production” is the Kirov region. The capital city of Kirov, named after a Bolshevik leader and for some reason never officially having gotten back its pre-revolutionary name, is still traditionally called by its original name, Vyatka. When hearing “vyatskie ryzhiki” (saffron milk-caps from Vyatka), any Russian gourmet is apt to start salivating. These harsh northern climes are still full of old-growth pine forests, where the best saffron milk caps in the country (called upland saffron milk caps) are found. They say that all northern saffron milk caps are good, but the ones from Vyatka are legendary. Their closest relatives, spruce saffron milk caps, as well as alpine saffron milk caps, known in Europe, are not nearly as prized. Vyatka and its environs have retained the unique dry method of pickling this mushroom, as archaic as the name of the locale, which comes from the name Vyatichi, as an ancient Slavic tribe was known. The bottom of an oak barrel is lined with juniper branches, over which water is poured, then rocks heated over a fire are thrown in and the barrel covered with a solid fabric. This is a way to sterilize the pickling container and to allow the aroma – the only spice present – to permeate the walls of the barrel. The water drained and the branches removed, the barrel is then loaded with layers of carefully prepared mushrooms. By no means are they to be washed, as the saffron milk cap contains lactarioviolin, a natural antibiotic. Using a clean cloth, the mushrooms are thoroughly cleansed of pine needles and sand. They are then stacked in layers and uniformly sprayed with coarse salt, 40 grams to 60 gram of which is needed for every kilogram of mushrooms. Once the barrel is full, another layer of salt is added, and then a wooden disk goes in, and on top of it a weight, usually a clean piece of granite fieldstone. The brine forming at the top is usually drained; there shouldn’t be too much of it. In a month, at 6-8 degrees Celsius (the natural temperature of a country cellar) the classic vodka hors d'oeuvre is ready. Nutritionists benignly look upon the saffron milk cap. Mycoprotein is usually not easily digestible by humans, but in the case of the saffron milk cap, the protein consists of easily absorbed amino acids, and calorie-wise, the pickled saffron milk cap is comparable, and even superior to, veal. It is one of the few mushrooms that it is possible, and even advisable, to eat raw – all it takes is placing the mushroom gills up, sprinkling with salt, and letting it sit for an hour or two. When the mushroom starts to bleed, it’s ready to eat. Once he or she tries a raw saffron milk cap, the most refined gourmet will understand why this magnificent mushroom does not lack for spices, for its inherent flavor — redolent to some of garlic, to others of ginger, but more delicate, and with a fruity aftertaste — needs no complement.